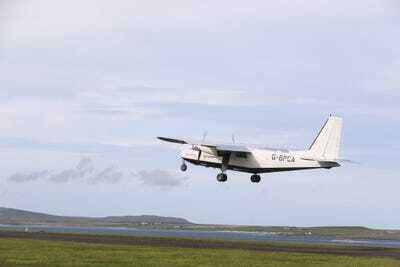 LoganairThe Britten-Norman Islanders that flies between between Westray and Papa Westray. 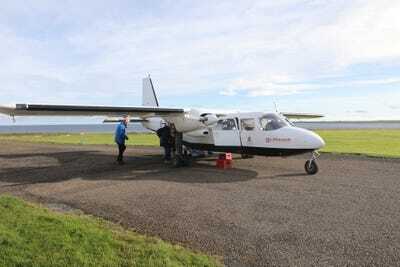 The shortest commercial flight in the world is a 1.7-mile route between two Scottish islands. The flight between Westray and Papa Westray near the mainland of Orkney lasts just 57 seconds. The shortest commercial flight in the world is in the air for just 57 seconds – and it costs £36 ($US51) return. The route from airline Loganair, the only major UK airline owned and headquartered in Scotland, covers 1.7 miles between the two islands of Westray and Papa Westray, near the mainland of Orkney, an archipelago in the Northern Isles of Scotland. The flights are serviced by two, eight-seater Britten-Norman Islanders, and while the flight takes an average of one and a half minutes – making it the shortest scheduled route in the world – the quickest time on record is 57 seconds in the air “in a favourable wind,” according to the airline. 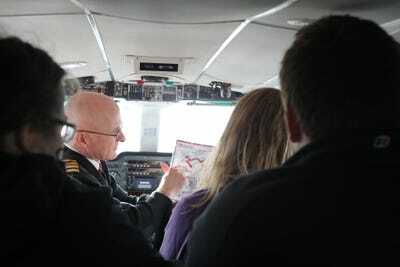 The route is about the same length as the runway at Edinburgh airport and burns just 10kg of fuel – about £15 worth. “Given that a Boeing 747 can use 1.5 tonnes of fuel taxiing before take-off, this makes it a pretty green form of travel,” the airline told Business Insider. The airline has been running the route since 1967, celebrating its 50th anniversary in 2017. It appears that passengers get a certificate when they complete the flight. The Orkney Inter-Isles Air Service connects the Orkney mainland with six outer islands, Eday, North Ronaldsay, Papa Westray, Sanday, Stronsay, and Westray – and the airline saw its millionth passenger in October. Privately-owned Loganair was founded in 1962 and has 30 aircraft in its fleet. It opened a new terminal building at Sanday in 2017, and carries nearly 700,000 passengers every year. …and the decor on board is much the same. There’s even the odd “wee dram” for passengers – but there’s no drink service on the 57-second flight.